Liquid mesh is fast spreading across the grid and the Redgrave team has made their mark in those ranks with this new, ready-for-summer dress. First off, I love the one shoulder look of this piece and the draping to the waist that has a bit of Indian flair to it. The HUD that comes with this dress has some crazy customization options. Not only can you change fabrics, but textures and patterns as well as colors that completely change the look and feel of each one. There is also a random color picker, as well, for some rather nifty results. 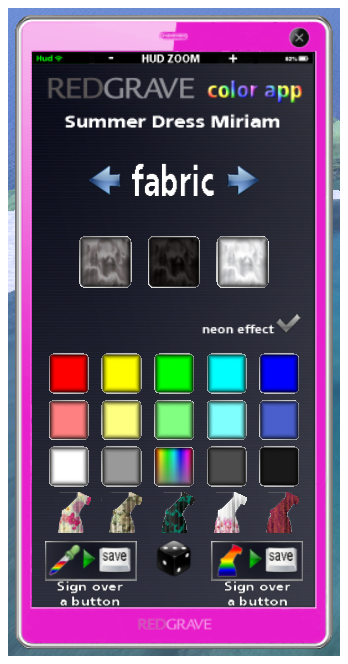 Also new in this HUD, is an option to give the dress a neon glow, perfect for raves or nighttime parties. And for those of you who are not familiar with Liquid Mesh, here’s the simple lowdown: Liquid mesh is rigged; however, it does adjust according to an avatar’s shape (within reason,) therefore eliminating the need for a standard size. Of course, liquid mesh isn’t without its faults, either. Without the use of an alpha layer, body parts will still likely poke through the mesh, but in using an alpha layer that is designed on one shape, you’ll undoubtedly find yourself with transparency issues in areas that are not covered by the mesh itself. There is still some debate on whether liquid mesh will have a future in SL, but in the meantime, I haven’t encountered too many faults with the pieces I have tried out in the past. As for the rest of my outfit, I was trying to decide on what shoes to wear with the dress when I stumbled across these exclusive colored sandals from Hucci. I never seem to actually blog the shoes the day of the 21Shoe Event, but at least you guys can get an idea of some of the awesome releases that are exclusive to this event. For more info, be sure to check out the website, and don’t forget to join the inworld group for reminders and notices for each month!